AS YOU MAY have heard, there is a movement abroad in the land to make America great again. To hear The New Yorker's Adam Gopnik tell it, it was never great in the first place. "What if it was a mistake from the start?" asks the magazine's longtime essayist and critic. "The Declaration of Independence, the American Revolution, the creation of the United States of America — what if all this was a terrible idea, and what if the injustices and madness of American life since then have occurred not in spite of the virtues of the Founding Fathers but because of them?" Abraham Lincoln famously described the nation created by America's founders as "the last, best hope of Earth." But in Gopnik's view, it is more realistic to understand the Revolution as "a needless and brutal bit of slaveholders' panic mixed with Enlightenment argle-bargle, producing a country that was always marked for violence and disruption and demagogy." How much better the world would be, he suggests, had America followed Canada's example and remained under the British crown. 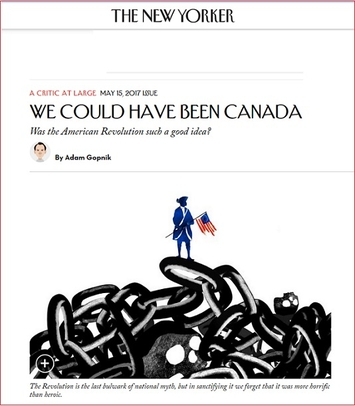 "No revolution, and slavery might have ended, as it did elsewhere in the British Empire, more peacefully and sooner. . . . We could have ended with a social-democratic commonwealth that stretched from north to south, a near-continent-wide Canada." The New Yorker's author appears to see America in much the same way that radical Boston historian Howard Zinn saw it: antidemocratic, oppressive, devoid of compassion, and too quick to kill. Considering all that the American Revolution led to, Gopnik writes, "leaves us with a big question: Was it really worth it, and are we better off for its having happened?" And for any reader who hasn't yet figured out where he's coming from, he continues: "In plain American, is Donald Trump a bug or a feature of the American heritage?" Gopnik had better be careful: With stretches like that, he's apt to rupture a ligament. The Founding Fathers had their failings, but to link their ideas to Trump is to commit historical vandalism. American independence was grounded in an idea: the "self-evident" truth that "all men are created equal" and endowed by God with an "unalienable" right to life and liberty. That is the root of American exceptionalism, which Trump explicitly rejects. What was most revolutionary about the American founding was its repudiation of blood-and-soil nationalism. The America-for-Americans mindset embodied today by Trump — with its view of robust immigration as a problem, the free movement of goods as a threat, and the promotion of democratic liberty in the world as none of America's business — is light-years removed from the Founders' philosophy. And what to make of the assertion that if only Adams, Hancock, Franklin, and Hamilton had steered clear of rebellion, if only the Americans had stayed loyal to George III, there would have been no subsequent struggle over slavery? To be sure, slavery ended in Great Britain long before it was abolished in America. It ended, in fact, in 1772, while the American colonies were still under British sovereignty. Britain made no attempt to do away with American slavery then; is it plausible that it could have done away with it peacefully later? Not until the 1830s was slavery abolished in the British West Indies. London may have been able to impose emancipation by fiat on its island territories in the Caribbean; it is unthinkable that it would have been able to do so through the enormous American South. Had there been no successful American Revolution, slavery would eventually have vanished, of course. But its end would almost surely have been accompanied by terrible violence and bloodshed — just as it was in history's real timeline. 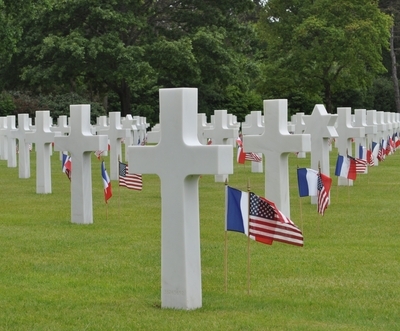 Of the slain heroes we honor on Memorial Day, tens of thousands died so that human beings far from American shores could know life, liberty, and the pursuit of happiness. Above: the US military cemetery in Normandy, France. Look to Canada, Gopnik writes, to see how much more peaceful an existence America could have chosen. Granted, there was no ghastly Civil War north of the border. But that wasn't because Canadians "were more enlightened than we," as Kyle Sammin observes in The Federalist. "It is because they had almost no slaves." Had the American colonies and Canada remained united under British rule, "our civil war would have been an Empire-wide conflagration, and Canadian blood would have been shed along with American and British blood." Counterfactual history can be fun to play with. Gopnik's hypothesis is provocative. But when all is said and done, can anyone soberly argue that the emergence of the United States has been a terrible mistake? In all of human history, no nation has sacrificed so much to liberate so many. Of the slain heroes we honor this Memorial Day, many tens of thousands died so that human beings far from American shores could know life, liberty, and the pursuit of happiness. Without America, would Nazism have been crushed? Would the Iron Curtain have come down? Would there be more peace, freedom, and prosperity in the world — or less? "Was the American Revolution Such a Good Idea?" It's an eye-catching headline, but the answer is obvious. It was a good idea, all right. One of the best. Want to read more Jeff Jacoby? Sign up for "Arguable," his weekly email newsletter.